The Cecil Angel Cup, won two years in a row by Coventry Conversations inventor and producer John Mair, has gone to a student society this year. The East Asian Film Society (CUEAFS) with founder Spencer Murphy received the award at the official graduation ceremony on 21 November 2011. The Cecil Angel Cup, which is the most prestigious prize for recognition in the university, is given every year to staff and students for “significant contribution to the development and well-being of the institution and significant enhancement of its reputation”. 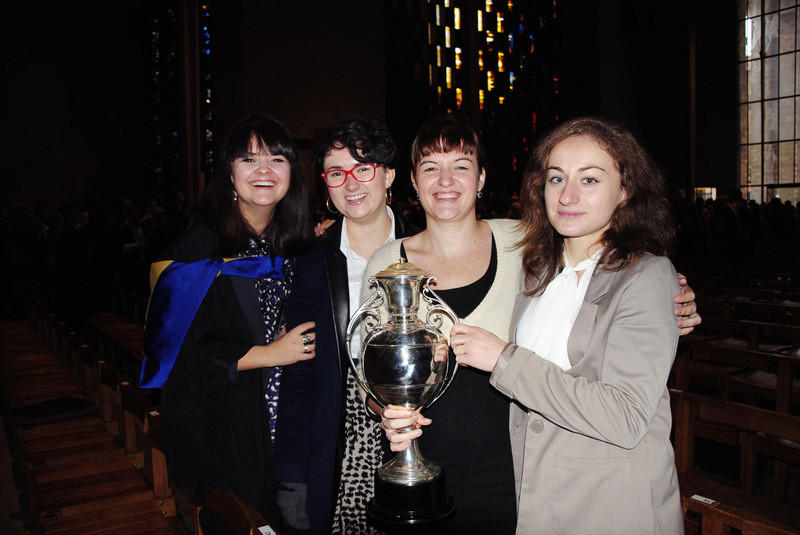 Diana Stefanescu, first president of the society and one of the two students behind the nomination, first set her eyes on the award at last year’s graduation ceremony. “When I saw it [the award] advertised on CU Online I had a look at all the awards and thought this one really suited the society”, she said. “A boost in our confidence always helps. “In the end it is a privilege to not only graduate but be awarded with the prize as well”. Written by Antoniya Petkova – Third Year Student. Since its foundation in 2009, the society has had amazing achievements, such as distributor sponsorships and donations, visits from directors, sponsored international trips for staff and students, reviews published on professional platforms and the first East Asian film festival and symposium in the Midlands. The commitment and passion by both members and founder Spencer Murphy was recognised at the Students Union award ceremony of 2011, when they received the award for Best Society. Shaun Hides, Head of the Media and Communications department in the university, has always been very supportive of the society’s activities and was pleased to be able to support the society’s nomination for the Cecil Angel Cup. “It’s brilliant that they have won”, he commented, – “CUEAFS is an expression of how great it can be to be part of something imaginative and innovative as a student here”.